A principal solo artist for more than two decades, Leighton has performed with many of the world’s eminent conductors, including Pierre Boulez, Zubin Mehta, the late Lorin Maazel, Simon Rattle, Esa-Pekka Salonen, Gustavo Dudamel, Bramwell Tovey and the late Rafael Frühbeck de Burgos. Her opera credits include principal appearances with New York City Opera, Glimmerglass Opera, Köln Opera, Paris Opera and Glyndebourne. She has recorded more films with composers John Williams, James Horner, Jerry Goldsmith, Ennio Morricone, Danny Elfman, James Newton Howard, Henry Jackman, Mark Mancina, Dennis McCarthy, Nick Glennie Smith, Steven Jablonsky, and Christophe Beck, and her voice can be heard on more than 85 major motion picture soundtracks. Most recently she worked on Small Foot, Venom, and Wreck It Ralph 3. As a choral conductor, Leighton embraces a broad range of music, from the Renaissance to the Romantic Era, although she is particularly dedicated to twentieth and twenty-first century compositions. A long-time advocate of music education, she inaugurated Los Robles Master Chorale’s annual High School Choral Festival, launched the High School Choral Leadership Workshop, and has established LRMC’s Young Artist Choral Composers Competition. In 2016, Leighton launched a young composer’s competition for Los Angeles Master Chorale’s annual High School Choir Festival, and she co-produced LAMC’s David Lang national anthems album. This season she reunites with Lang to conduct his opera the loser for Los Angeles Opera, and to conduct Crowd Out with the Los Angeles Philharmonic. They will also record Lang’s opera the loser in March 2019. Leighton was named the first associate conductor in the history of Los Angeles Master Chorale in July 2011 following a year as assistant conductor. She was appointed artistic director of Los Robles Master Chorale in 2008, and music director of New West Symphony Chorus in 2009. She served as interim director of choral activities at La Sierra University during the 2013-14 academic year, at UCLA as director of choruses from 2014-16, and was appointed interim director of choral activities at California State University San Bernardino in June of 2016. In addition, she regularly conducted the Los Angeles Master Chorale Chamber Singers for six years, and has also been guest-conductor at the Agoura Performing Arts Center, Marlborough High School, Agoura High School, and taught several conducting seminars for LAUSD teachers. Leighton has prepared choirs for Gustavo Dudamel, Esa-Pekka Salonen, Rafael Frühbeck de Burgos, Bramwell Tovey, Leonard Slatkin, Michael Tilson Thomas, Boris Brott and Marcello Lehninger. She was awarded the Order of Areté from USC, the highest honor accorded to graduate students upon completion of their academic programs; the Choral Department Award for Excellence from Thornton School of Music, twice; Remarkable Women Awards for outstanding achievement in a chosen field from the University of Southern California; the Raymond Moremen Award for Choral Excellence from the University of California, Los Angeles; and the Outstanding Achievement Choral Award from Loyola Marymount University. Leighton is also a member of Pi Kappa Lambda, the National Music Honor Society, Eta Chapter, American Choral Director’s Association (ACDA), Chorus America, Southern California Vocal Association (SCVA), Screen Actors Guild (SAG), American Guild of Musical Artists (AGMA), the League of American Orchestras, and the American Society of Composers, Authors and Publishers (ASCAP). 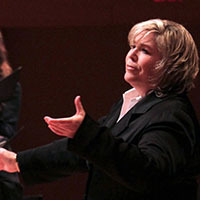 In addition to a variety of appearances as a choral conductor with Los Angeles Master Chorale, Los Robles Master Chorale, New West Symphony Chorus, and with the UCLA choral union, Leighton prepared her regional choir for the world premiere performance of John Wineglass’ Voices of the West with San Bernardino Symphony Orchestra in October 2018, and will prepare them for David Lang’s Crowd Out when she conducts the work with Los Angeles Philharmonic in 2019. A native of Los Angeles, Leighton studied conducting with Paul Salamunovich at Loyola Marymount University, where she earned her BA in choral music. Following choral study at UCLA with Bill Hatcher, she later obtained an MM in vocal performance with Judith Oas Natalucci, and a DMA in choral music from the University of Southern California with Jo-Michael Scheibe. Leighton also enjoys working with all levels of choirs and is a frequent guest conductor, workshop adjudicator and choral clinician.